More than 200 boys participated in this year’s annual scouting event. Ryan Cherfane, station leader Mike Hohman, Joey Stapleton and Aidan Folcher of Troop 252 perform the timber challenge — one of the nine scouting skills tested at the Klondike Derby. Beneath a canopy of bare branches, wooden sleds serpentined through crackling leaves. Although unseasonably warm weather settled upon Pine Hill Scout Reservation, it did not deter dozens of Boy Scouts from glazing their snow-designed vehicles through the 2018 Klondike Derby. 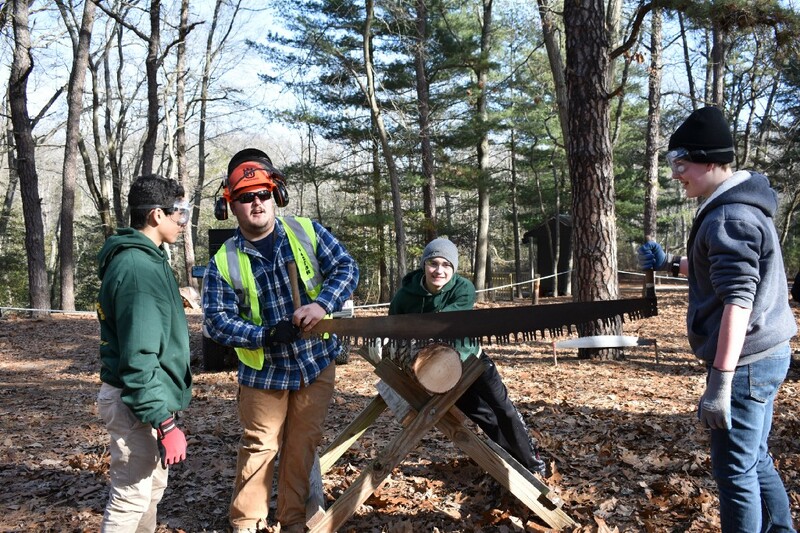 Last weekend’s Scouting event, which has taken place at Pine Hill for decades, strives to strengthen a series of Scoutcraft skills, encompassing an assortment of woodcraft knowledge. This year’s annual derby drew more than 230 Scouts from across South Jersey — the most attendance the Boy Scouts of America’s White Horse District has seen in recent years. There were roughly 189 Scouts, 40 Webelos and 18 units, including two troops from outside of the district. Using sleds for resource storage, the Scouts must master nine challenges scattered throughout the reservation, including stations such as the fire challenge, knot challenge, rescue challenge, first aid challenge, lashing challenge and disability challenge. Troops can earn up to 50 points per station, accumulating a grand goal of 450. Each of the 32 sleds circling around the camp had a leader along with a handful of Scouts. She says during Eagle boards reviews, a process in which a boy becomes an Eagle Scout, several candidates say the Klondike Derby was the most effective event of their Scouting experience. Many of the skills they’re fostering at the derby are not confined to the wilderness, as they can be applied to other areas of life. Several troops expressed the skills of the derby emulate Scouting objectives, especially the nonphysical ones. “The Klondike Derby allows trust between other Scouts and shows how you are as a group together,” said Gavin Ruby, a member of Troop 132 from Sicklerville. Whether starting a fire or tying a knot, many say a chief component of the day is the meticulous mentorship between younger Scouts and older ones. The derby allows for superiors such as Eagle Scouts and Scoutmasters to provide one-on-one training to budding Scouts. Weaving through the woods, Scouts eagerly bopped around from station to station. Some presented easier tasks than others, as the spider web knots were thrilling to maneuver, while the wilderness survival required a bit more contemplation. “Everything Scouts need to know is all crammed into one event,” said Joey Cruz of Troop 48 from Berlin. Scouts also have to keep small details in mind such as asking permission to enter a station. Forgetting to seek permission can dock a troop two points. While the 60 degrees of sunshine made for light attire, it did not, necessarily, make for easy travel, as some Scouts felt icy weather allows the sleds to glide more easily than grainy dirt. But regardless of weather gambles, nothing can keep Scouts from returning each year, as for some, this derby has evolved into a decades-old dedication. As the event drew to a close, tents broke down and fires burned out but not before winners were announced. Troop 179 of Haddon Township cliched third place with a score of 423, Troop 67 of Haddon Heights clinched second with a score of 430, and Troop 159 of Waterford Township took home first place with 435 points. No matter the final results, the day centered on healthy competition, immersing kids in nature while acquiring not only survival but ethical lessons.